The EMALU products are both robust and lightweight for everyday use by all members of your family. Your EMALU gate will not warp, drop, bend or twist. The colour finishing will not crack overtime. The EMALU gates are made of 100% aluminium using high-grade and state-of-the-art material. They do not require any special surface treatment before or after installing. They are resistant to the most extreme weather conditions. 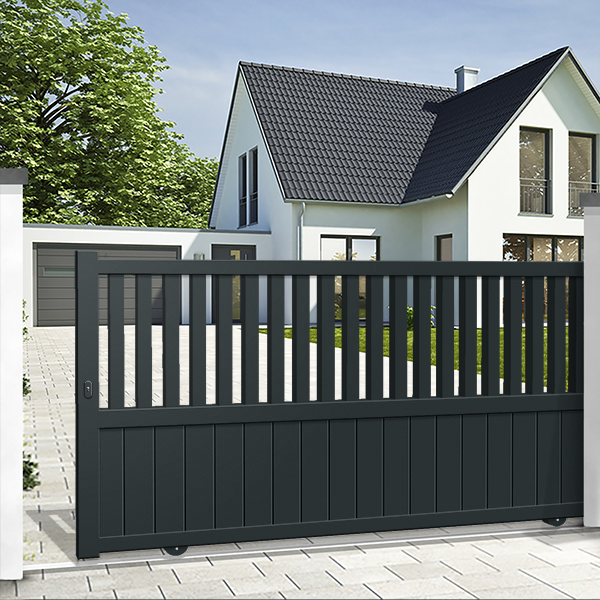 Your EMALU gate is designed from the beginning to accommodate automatic gate opener. A reinforced profile spanning the width allows for an easy and fast installation of an automation kit for a daily comfort. EMALU gates are provided with all the fixtures and fittings needed, you would not have thought that it would be that easy to install the gate. With help of our instruction manuals and videos you will find out how easy it is to install the gate yourself. EMALU stands for sustainability, committed to an eco-friendly environment. All our gates are made of 100% recyclable aluminium, one of the most environmentally friendly processes across the metals industry and can be endlessly recycled while keeping its distinctive properties. Do you want your sliding gate automated? Our team of experts has selected for you one of the best automatic gate driver systems available on the market, easy control and access. As soon as you have decided for an automation system, we propose different accessories to improve your access and protection to and of your property. Check out in the menu bar Automation, Access Control and Gate remotes. - Incorporated electronic circuit board in the control panel. - LED light integrated in circuit board for an easy diagnosis of the state of the electronics in your gate operator. - Easy installation with 1 single cable up to 3 devices. - Includes release hatch for manual opening in case of power failure. Are you after a secure and elegant gate for your home but are limited by space? Then a sliding gate may be what you are looking for. Secure, robust, durable and elegant: the sliding gate is becoming an increasingly popular option for good reason. Discover our wide range of sliding gates on MisterGatesDirect!